Fendrihan AS-D2 -- Was an impulsive new years buy. Haven't opened it yet, and am now considering returning it. Thinking that maybe an adjustable razor would be a better choice to figure out what works best for me. Rockwell Razors S6 -- Just ordered. Thinking an adjustable would be a better option to figure out what works for me. 100 pack of Derby Premium blades. 100 pack of Wilkinson Sword blades from India. Sampler packs containing -- feather black, feather yellow, gillette silver blue, Astra blue, Astra green, Wilkinson Sword german, Personna comfort coated, Personna Platinum, Personna lab blue, Gillette 7'o clock yellow, Gillette 7'o clock green, Derby green, perma sharp. I also have a 1932 Gillette Tech on loan for a few days. This doesn't even mention other stuff from before I started wet shaving. I shave my head, but still don't have the confidence to shave the back of my head with a DE razor. So, I shave the front of my head with a DE razor and the back of my head with a cartridge razor. Too much stuff!! Welcome your comments. You don't have too much stuff. However, you may want to take some time to determine your preferences by using and getting to know what you already have. To much... I'm sorry, I don't understand the concept? If you use and enjoy the shaving item - not too much gear. List looks "balanced" with regard to types of shaving items (more typical would be 16 soaps and 15 other items). 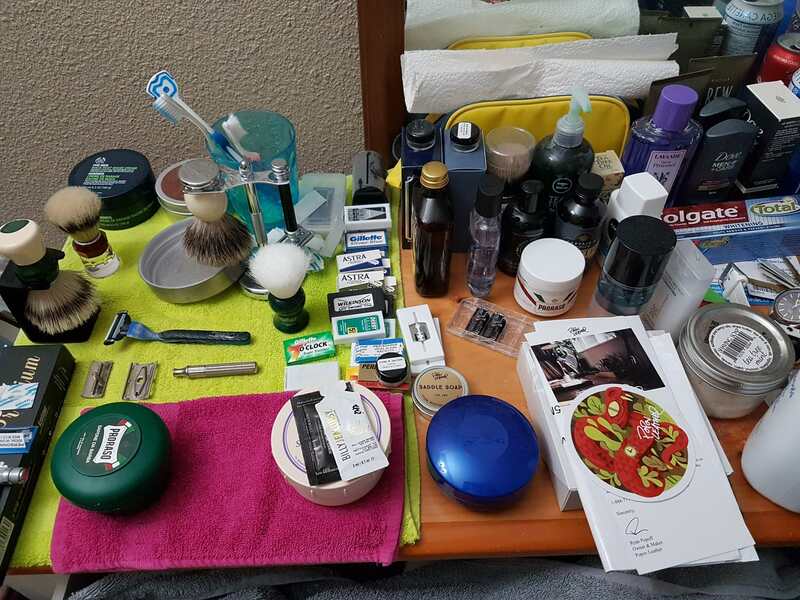 How much more space do you have in your shave den? I did not notice a Wolfman, Rocnel, Paladin, Brad Sears / M&F, Above the Tie, Elite Razor, etc in your list. Well done. You're off to a great start! Get to know your present gear well. Like Hans said, you may find yourself thinning the den after a while. In all likelihood you'll discover what works best for you and will continue building from there. Enjoy your shaves! Start with a solid baseline of a small handful of products and use use use them! Then you can really start judging other and new products against the ones you know best and how they work with your skin. You definitely could have more product so I would say take your time with understanding what will keep your shaves more consistent rather than enjoying variety to the nth degree. (03-18-2018, 02:35 PM)Smudge Wrote: No synthetic brush? Omega 90065 he said.... however; no horse? I think you have a great selection of products! You might want to consider getting rid of the toothbrushes. (03-18-2018, 03:17 PM)Barrylu Wrote: You might want to consider getting rid of the toothbrushes. +1 Taking up valuable shave den space. FYI Quip toothbrush comes with wall mount and battery operated. That's not so bad. I only began Dec 1 and have sold close to half of the DE's I have purchased...but only 3 razors were modern. This was where I went off the deep end. Your approach seems quite balanced. Razors, product, blades, and brushes. What led you in the directions you went? If you can still see the counter top, you still have more room for acquisitions. If you like it, can afford it, and use it - no problem. Your collection looks fine. It is easy to want to try everything, as well to get excited for new releases, but there is no rush. Enjoy what you have and add as you see something that is really special to you. Just have fun and enjoy at a pace you are comfortable with. I find I could horde soaps and AS that would last 5 life times if I did not made an effort to pace myself at this point. Clutter becomes stressful to me, so for now I am enjoying the soaps I have collected. (03-18-2018, 01:46 PM)SCOV Wrote: If you use and enjoy the shaving item - not too much gear. List looks "balanced" with regard to types of shaving items (more typical would be 16 soaps and 15 other items). Plenty of room in the shave den, but restricted by budget. I recently started a full time 2 year masters degree at University, so funds are very limited. Maybe a Wolfman will make a good graduation gift to myself. Sorry. Duplicate post. Moderator please delete. Thats a question I have and I have started a new thread to ask this question. -- Is a horse hair brush a must have? (03-18-2018, 04:34 PM)rev579 Wrote: That's not so bad. I only began Dec 1 and have sold close to half of the DE's I have purchased...but only 3 razors were modern. This was where I went off the deep end. Your approach seems quite balanced. Razors, product, blades, and brushes. What led you in the directions you went? I started with the Wilkinson Sword puck and the cheap $5 synthetic Wilkinson Sword brush from Walmart. Did not go well, partly also because I did not know how to lather that puck and was impatient with it. 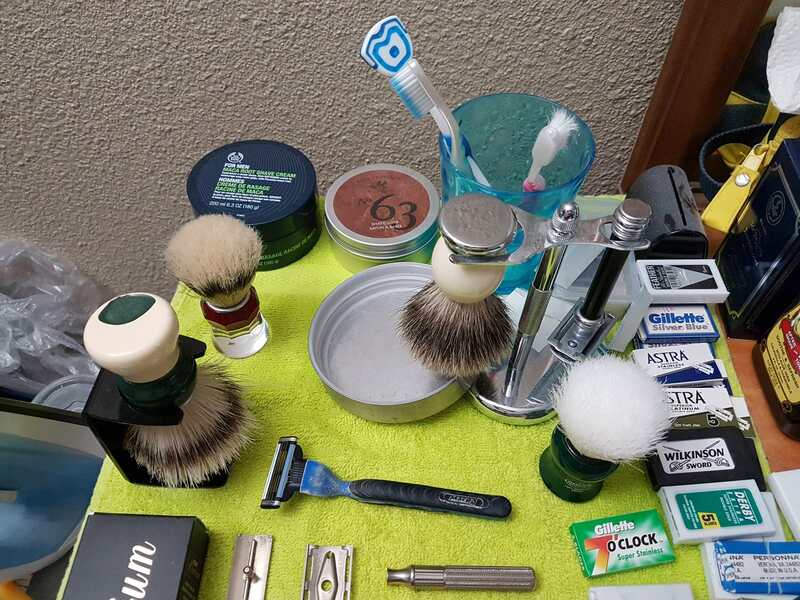 So I decided the only way I was going to know if wet shaving would work for me was if I have better gear. 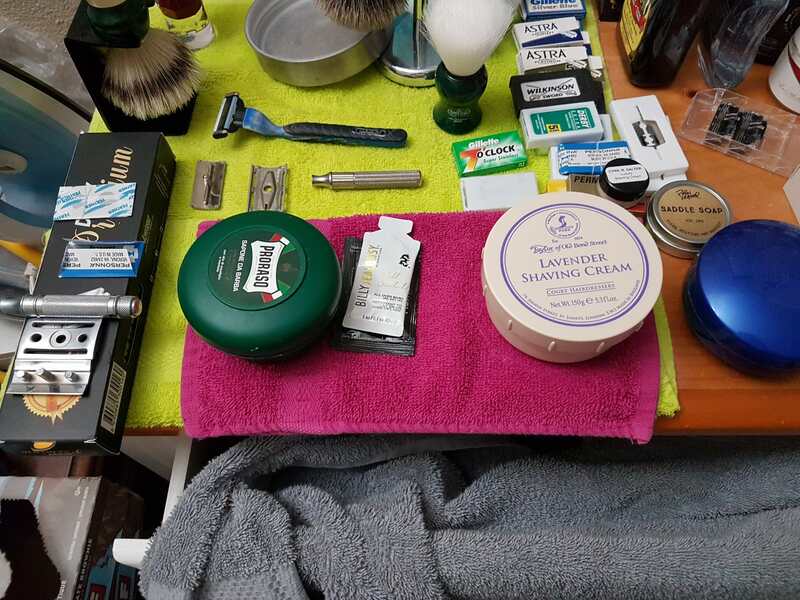 So then I bought an Edwin Jagger DE89, Proraso Green tub, Semogue 1305, the Omega 90065 and a sampler blade pack of 60 blades. Didn't like the Omega synthetic. It was completely floppy and did not lather well. This put me off from synthetics and I decided to stick with natural hair brushes for now. After using the other items, I was convinced wet shaving would work for me and I would never shave my face with a cartridge again. Then of course I got pulled into the world of options. I think I am prone to wanting to buy a lot of stuff in things I am interested in. So I set myself a budget and then pick the next item I want. When the budget is there, I buy it. TOBS Eton college aftershave was a gift from my girlfriend. 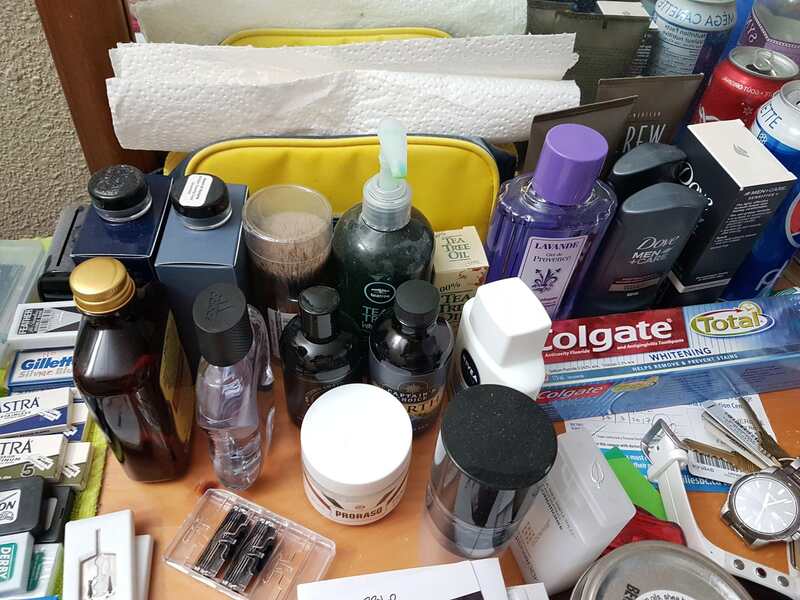 I knew as a full time student in 2018 and 2019, my budget would be small, so before 2018 started, I tried to find quality products that were good value for money and also enough shave soap and aftershave to last 2 years. I wanted enough aftershave because I feel that good aftershave products make the overall shave better for me. Some items were impulse buys, like the Hans Baiers and the Semogue 830. Maca root and TOBS lavander shave cream were on sale, and I wanted something better than proraso. Proraso is good, but it was drying out my skin at the end of the shave and leaving a residue on the razor. I am using the remainder of the proraso to shave my head. When that is finished, I will probably use just the Maca Root shave cream to shave my head. I saw PDP 63 in my local pharmacy and I loved the smell of it and it had good reviews. Bought the Merkur 38C because I wanted a longer and heavier razor than the Edwin Jagger Kelvin. The Rockwell blades were free with the razor, with the 2 other 100 blade packs were purchases from amazon which needed a little bump for free shipping and the price of the blade pack was the same as I would have had to pay for shipping. The feather AS-D2 was my large impulse buy at the start of 2018. I had the budget at the time and went for it. But now I will be returning it, as I feel the Rockwell will give me more options. So, as you can see, it was combinations of planning, budgeting and impulse. (03-18-2018, 02:37 PM)WegianWarrior Wrote: Omega 90065 he said.... however; no horse? (03-18-2018, 01:19 PM)meshave Wrote: Welcome your comments. Ditch the Colgate Total and replace it with Colgate Baking Soda & Peroxide.